If you imagine Costa Rica to be a paradise of pristine beaches, exotic flowers, thick rainforests, and crystal-clear waters, where monkeys and sloths and scarlet macaws frolic freely, then you have Manuel Antonio National Park in mind. The smallest national park in the country, this is also the most visited--a true paradise for beach-goers and nature lovers, where emerald rainforest spills into turquoise sea. Beaches are the primary draw to the park. As opposed to other national parks in Costa Rica, where people come to hike, most visitors to Manuel Antonio National Park consider hiking to be secondary; they’ll walk only to get where they’re going--the beach. A highlight is Playa Gemelas, or Twin Beach, so named for its split coastline, divided by a large boulder. Playa Manuel Antonio is regarded as one of the most beautiful beaches in Costa Rica. Playa Espadilla Sur, a wide expanse, draws many visitors--especially during low tide. Mangrove forests are observable from the trails parallel to Playa Manuel Antonio and Espadilla Sur. La Trampa (The Trap) is a circular rock formation of archaeological significance. It is thought to have once been used to trap turtles and fish. Trails for hiking are short but worthwhile. Choose from one of five: the Main Trail, a sandy path that links the park’s beaches; Cathedral Point, which (unsurprisingly) winds out to Cathedral Point; Trampa, which connects with Cathedral Point and leads to La Trampa; Playa Gemelas and Punto Escondido Trail, which connects the main beach to these two, less visited beaches; and Mirador Trail, which goes up into the forest and leads to beautiful lookout points. Visit a tropical fruit farm to learn about the small-scale farming methods in practice, and have a juicy taste of the produce. Quepos is the nearest town and port that sits just north of Manuel Antonio National Park, with hotels and restaurants scattered on the short road between the town and park. Manuel Antonio, as the general area is called, is one of the top destinations in Costa Rica, and almost every tour includes Manuel Antonio National Park on the itinerary. At only 4,825 land acres, Manuel Antonio National Park is Costa Rica’s smallest national park, in terms of land area. However, it also expands across 63,343 marine acres. 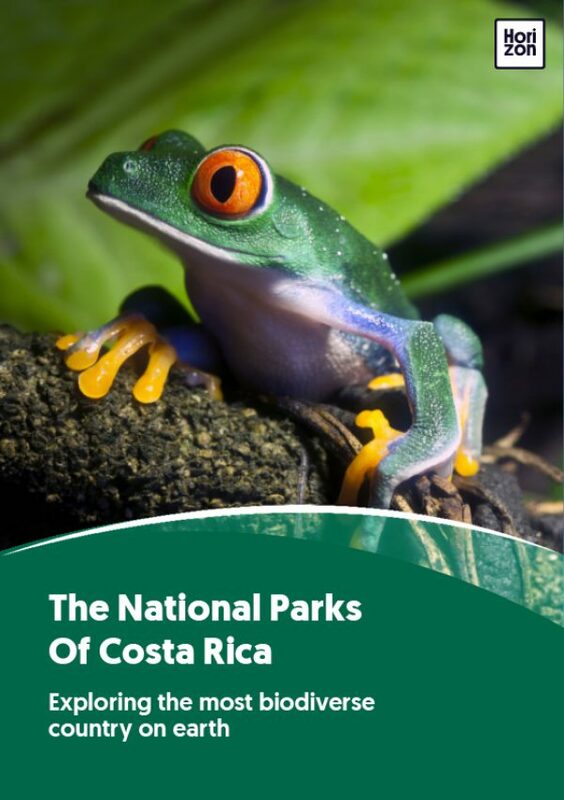 The park was established on November 15, 1972, making it Costa Rica’s sixth national park. Facilities include potable water, restrooms, changing rooms, and showers (no soap or shampoo allowed). Marked walking trails lead past lookout points, or “miradors”. Camping is not allowed at Manuel Antonio National Park. Manuel Antonio is one of Costa Rica’s most accessible parks and is easily reachable by public bus from San José. That said there are advantages to visiting with a tour, especially if you’ll be covering a lot of ground on your trip. The convenience of private transfers and pre-booked lodges make huge time savings. Manuel Antonio National Park comprises very wet rainforest and receives more than 150 inches of rain a year. Average temperature is 27-30 C (81-86 F). This being a rainforest, it rains year-round. That said, the wet season lasts mid-November through May, with the remaining months being drier but with sporadic showers. High season is during the drier months, when chances of thunderstorms are much lower. Manuel Antonio is mostly made up of primary rainforest, although there is some secondary growth. Additionally, there are mangroves, coastline, islands, a small lagoon, and of course, the park’s marine acres, which host various ocean life, including coral. Wildlife seekers can keep an eye out for any of the reported 107 mammal species. Favorites are the Central American squirrel monkeys, white-faced monkeys, howler monkeys, two- and three-toed sloths, white-tailed coatis, and white-tailed deer. 335 bird species span from brown boobies and frigate birds to green kingfishers, and pelicans. In the water, 237 marine animals dwell, including angel fish, sea urchins, crabs, and starfish. From San José, the park is 110 miles (3-3.5 hours) southwest by vehicle. Closest airport is the Quepos Regional Airport at 7.5 miles away. To reach the park, fly into SJO, then stay in Quepos (more budget-friendly) or Manuel Antonio (more upscale resorts). There is one park entrance, located at the southern end of Playa Espadilla Sur. Parking is available outside the park. Entrance cost: $16 adults, children under 12 free; tickets much be purchased at Coopealianza before 3 p.m.